Choose a topic to visit the recommended websites or read a message from champion gymnast Beth Tweddle. Gym-mad Tara still can't believe she's part of the Silverdale Gym Club - and that she's through to a national competition! But Tara's homework is starting to pile up and when her teachers notice that her schoolwork is sliding she's in big trouble... Can Tara finish all her work on time and win a gold medal? With a foreword by Olympic medal winner Beth Tweddle. Tara Bailey stood in the middle of the springy blue floor at Silverdale Gymnastics Club and shivered. It was her first day back in the gym after Christmas and outside it was icy, but the tingle running down Tara’s spine wasn’t from the cold. It was a shiver of excitement. “Ready?” asked Clare, her gymnastics coach. Tara bit her lip and nodded. She was definitely ready. In her mind, she’d been ready to do a backflip for months and months. But actually doing it was something different. She looked down at her feet, positioned neatly together on the floor. She could do backflips – or flicks, as all the gymnasts called them – with support from Clare, but she’d never tried one on her own before. The last few minutes of the training session were ticking away. It was now or…well, not never…but she wouldn’t get another chance until Friday, and two days away from Silverdale Gym seemed like for ever. “Go, Tara!” whooped Megan. Tara grinned down at the floor. The other members of her Acrobatic Gymnastics group knew how desperate she was to do a flick by herself. She’d hardly talked about anything else since Regionals two months ago – the first gymnastics competition she’d ever taken part in. Not only had she won her first ever gold medal, but Tara and her partner Lindsay had also won the chance to compete in the National Acro competition for their level in a few months’ time. Tara still couldn’t believe it…and she was training harder than ever to make sure she was ready. Standing very still, with her arms held by her sides, she prepared to try her first unassisted backflip. She kept her legs straight and leaned her weight back until she felt like she was about to topple over. Then she swung her arms up and pushed herself backwards, off the floor and onto her hands. Another push with her hands, and she was back on her feet again. Tara could hardly believe what had happened. She’d done a backflip without support, and she hadn’t even landed on her head! Tara nodded, breathless. It had been so quick that she hadn’t had time to think about being neat or any of the things she remembered to do when she practised on the trampoline. She tried once more and got all the way over again. But her legs would not stay stuck together like she wanted, and Clare said her knees were bent. “No, she’s right,” Tara replied. “I’ve got to keep practising until my flicks are better. Just getting over isn’t enough.” But she smiled at Lindsay to show that she didn’t mind Clare’s criticism, and she felt secretly pleased that Lindsay thought she’d done well. Besides, she’d managed two flicks in a row for the first time – nothing could ruin her day now. They watched Megan and Sophie, two older girls in their group. Tara couldn’t help feeling a bit jealous when she saw them take a run-up, jump onto both feet and whip their bodies round in tucked somersaults. One day, she promised herself…one day she’d be doing that, too. “That’s enough for today,” Clare said to Sophie, and Tara looked over her shoulder at the clock high up on the wall. The hands had reached six o’clock and training was over. Tara still felt butterflies in her stomach every time she remembered that she was one of the Nationals gymnasts. Megan and Sophie were going to the Nationals too, as well as Jasmine and Sam, the most advanced girls in their squad. Tara caught Megan’s eye and exchanged a sympathetic grimace with her. During the week away from Silverdale, she’d loved being able to relax and spend more time with her best friends from school, Emily and Kate. But after a few afternoons watching Christmas films she’d missed the gym, and she’d made a big effort to do half an hour of stretching at home every day. She hoped she’d still be able to fit it in when she went back to school. Excitement rippled around the group and Tara hugged her knees into her chest. Learning new balances was so exciting! In Acrobatic Gymnastics, gymnasts performed routines in pairs and groups of three or four. They had to do balances as well as floor skills like backflips and somersaults. Tara had only been doing Acro for half a year, but balances had quickly become her favourite challenge. 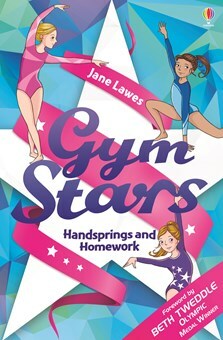 Now all her dreams were made up of spectacular routines full of things she’d seen the more experienced gymnasts at Silverdale doing – breathtaking balances and amazing throws and somersaults that she and Lindsay would learn to do sometime in the far-off future. Instead of imagining what it would be like to be a famous singer or a glamorous actress like her school friends sometimes did, she dreamed of being a famous gymnast like Beth Tweddle. “Wow, my legs ache so much,” groaned Sophie, when they’d wrapped themselves up in coats, scarves and gloves, and were walking out to the car park. “Wednesdays, Fridays, Saturdays, and now Sundays too – if Clare had her own way we’d be in the gym every day!” said Megan. “All day, every day,” laughed Sophie. “That would be so much better than school,” Tara said, smiling as she imagined it. Nothing but gymnastics – it sounded like heaven. Visit the author’s website, www.janelawes.co.uk, for more information. and challenges of competing at sport.